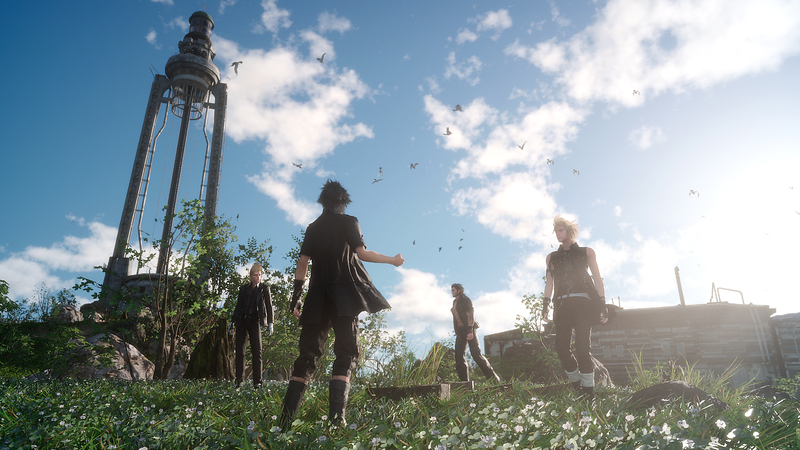 Final Fantasy XV – a review. Might contain spoilers. december 27, 2016 | Kommentarer inaktiverade för Final Fantasy XV – a review. Might contain spoilers. I’m going to cut to the chase – this was one of the worst games I have ever played to the end. It failed in almost every possible aspect. Story – first and foremost, I care about a good story. Even if my life was at stake, I couldn’t tell you what this game was about. I guess, four friends taking a roadtrip, camping and having fun for a couple of months while the country is in the middle of a war? There was a bad-guy, sortof, but it was never made clear why he was helping everyone out during most of the game. I guess he was just randomly crazy? And then there was some huge watersnake that you had to summon, and then kill to gain its power, but what power it gave you was never explained. I didn’t notice getting anything. I collected weapons from tombs, and they did something in the ending cutscenes. Not sure what. And there was a princess who did something. I think. There was a magic ring that no one explained. And plenty of explosions at the end. Characters – this game has gotten a lot of praise for its character chemistry…. But I have to disagree. Lots of repeating dialogue and one-liners, very little character developement outside the main story, and limited possibilites to customize (or use) your friends. I recall single lines from FFXII that told me volumes about the characters. In FFXV, I really have no idea about who these guys are, how we met or what keeps them at my side. Difficulty – I found the game to be insanely easy. This game just might go down in history as the game that replaced attack button spamming with attack button holding. You know, for the people who are too lazy to spam the attack button. Most fights just needed me to hold down the attack button and occationally switch to the button for zapping away. I never died once in about 70 hours of playing. I ran away from a couple of fights, though. Graphics and style – okay. The graphics were okay, somewhat. But I have two major complaints – first, lots of repeating objects. The whole open world is littered with identical trees of identical height, almost every roadside diner was identical copies etc. My other complaint is that the graphics just didn’t feel *fantasy* enough. The majority of the game environments were just so mundane. Until I hit the city Altissia, everything just felt very bleak and earth-like. It’s just not what I expect from a Final Fantasy game. From a FF game, I want to be transported into something fantastic. The americana middle-of-nowhere setting just didn’t do it for me. Pacing – a major problem for me was the pacing of the game. The actual story content is painfully short and if you finish a bunch of sidequests before you tackle the story, you will be annoyingly overlevelled for the story quests. I ran through ”tough” opponents like lego in the final chapters of the story. The game just doesn’t merge the storyline with the open world. If you do the quests in the open world first, you will be overlevelled for the story. If you do the story first, the open world will feel irrelevant to many players. Quests – It felt like most of the quests in the open world was either fetching something, or killing something for dubious reasons. Take, for instance, the quest that has you slay a behemoth – because you want to put its meat in a cup of noodles. Not because it was a terror to some village, or because it held some key to unlock some great object – but because you want to have noodles with meat. Or take the hunter quests that never explains why you need to slay different creatures. Sure, I can imagine killer bees to be a huge problem, but when the game has me killing off an entire herd of peaceful giraffe-looking creatures (complete with giraffe-like KIDS!) it just feels wrong. The game also does a very poor job of communicating to the player which quests that are important. There are so many quests offered, that I could have used some kind of guidance here. Will hunting every mark reward me with something I can actually use, or it is just a grind for experience? Which characters are important to the story? Will planting and harvesting stuff for Iris give me anything useful? Transportation – it’s a roadtrip, so let’s have a look at the transportation offered. First, a car that’s like it’s on rails. You can’t really drive it. You can assign it where to go using a clunky map with no connection to your quest map. You can fast travel, but this involves a loooooong loading screen. You can drive ”manually”, which involves holding down the R2 button while the car drives itself. Getting out of the car involves a loooong animation. Riding in the car involves some patry banter that quickly gets old, as it’s a very short supply of lines and animation and they are on repeat. You get chocobos, also, but they never feel as personal as they have in previous games. They are just rentals. Fake Fantasy – finally, I want to take a moment to mention how fake everything feels. The chocobos are rentals, the moogles are just plush toys, the arena is just for betting (not fighting), the car drives itself, the environment is very mundane, the side content overlevells you for the story content, the story is completely incomprehensible and the characters unmemorable. This just wasn’t Final Fantasy. It was a poor imitation and felt fake. Like some leftovers from previous FF ideas incompetently shoehorned inside an unfinished open-world game.